Need help selecting a paint color? Columbia Paint can help! Having to choose paint colors is one of the most fun, yet stressful parts of room design. There are so many options and selecting the perfect color can be a daunting task. Consider these five tips for choosing the right paint color, and you’ll be well on your way to creating the home you have always envisioned. Get out your favorite magazines, take a walk in nature, watch your favorite design shows, or draw inspiration from other elements within the space. Looking at your surroundings will spark a design idea that you may want to incorporate into your paint choice. Your furniture and other fixtures within the space will also help narrow down your choice as they’ll direct you toward a particular family or tone that would best complement those elements. When you get to your favorite paint or hardware store, buy the testers first. It will allow you to use the color in a small section of your wall to see if the idea that you had in mind will work with your room design. You can also cut out a square of cardboard to paint and tape up on your wall before actually applying paint to its surface. Matte, eggshell, satin, semi-gloss, and high-gloss options will all make a difference in how the paint color will appear on your wall. Consider which of these options most closely matches what you’re looking for and will highlight the tone or brightness of your color choice. The option that you choose should also complement the room design, whether you want to create a more calming atmosphere or a more high-energy space. Dark paint colors are excellent on the strip and will help bring out the true essence of your main color choice. It will also help you determine if the shade of color that you chose is truly what you were expecting it to be once you get it up on the wall. Is there a theme that you’re following in the room, or even on one of the floors in your home? 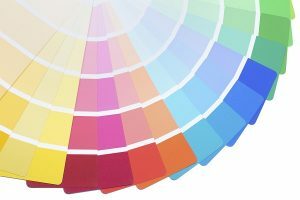 Think about how that theme will tie in together with your paint color choice. Rooms that are vastly different can be jarring to the eye; considering the overall theme of the space will create a cohesive color story.